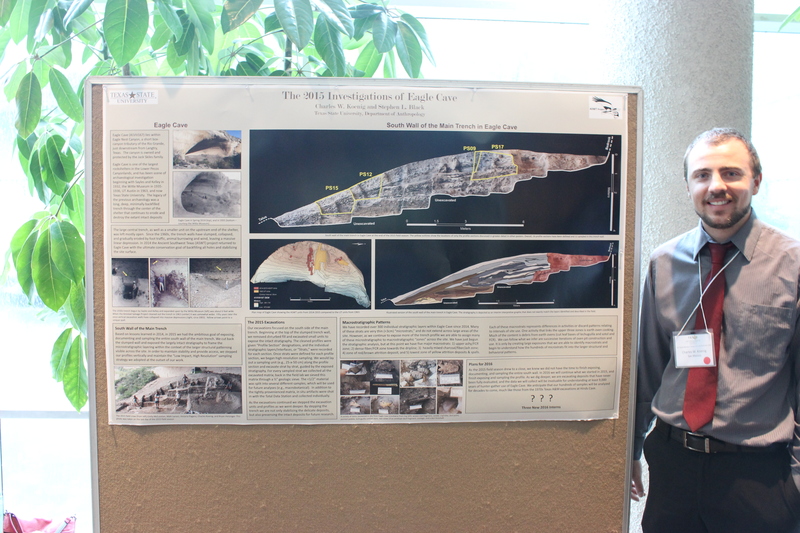 This past weekend (October 23-25th) the Texas Archeological Society held its 86th Annual Meeting in Houston, Texas. 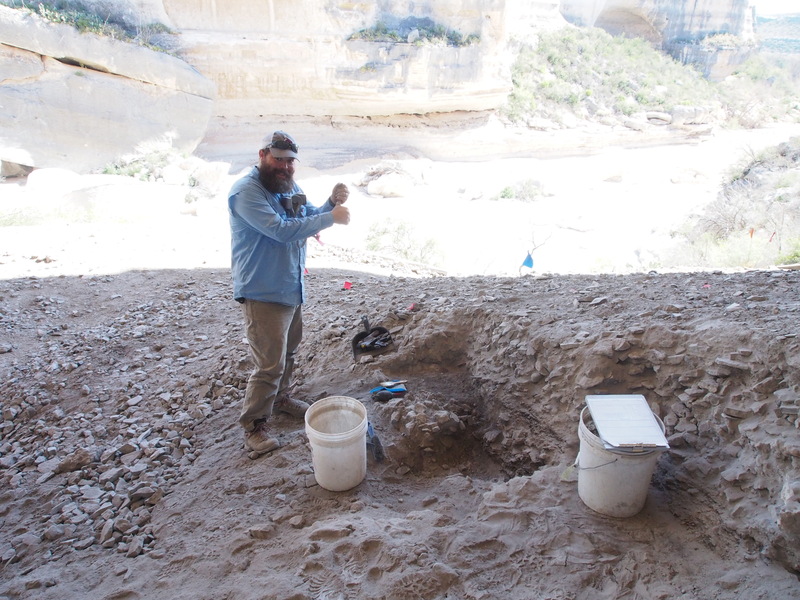 Our ongoing work in Eagle Nest Canyon was well represented, with a presentation by Charles Koenig on Friday detailing our use of SfM for documenting excavations, and a large poster session on Saturday. We decided the best way to share the posters with everyone who did not attend the annual meeting is to create individual blog post from each poster. So, each week through mid-December we will be adding a new blog post featuring one of the posters from TAS. 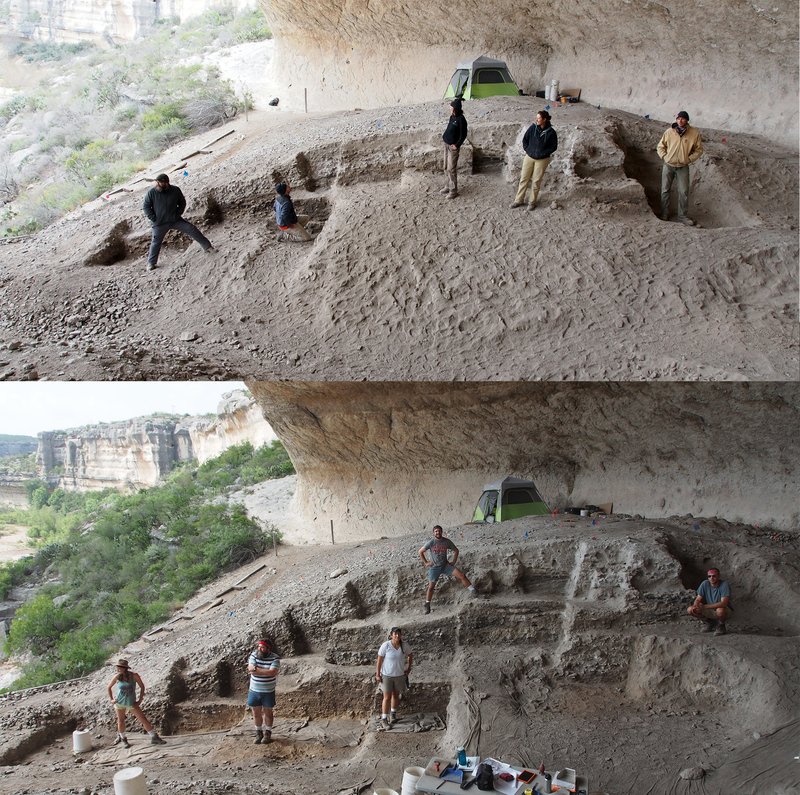 The first post is the poster by Charles and Steve that introduces our ongoing Eagle Cave work. You can also download the PDF version here: Koenig&Black_TAS2015_FINAL. Charles standing next to the Eagle Cave poster. 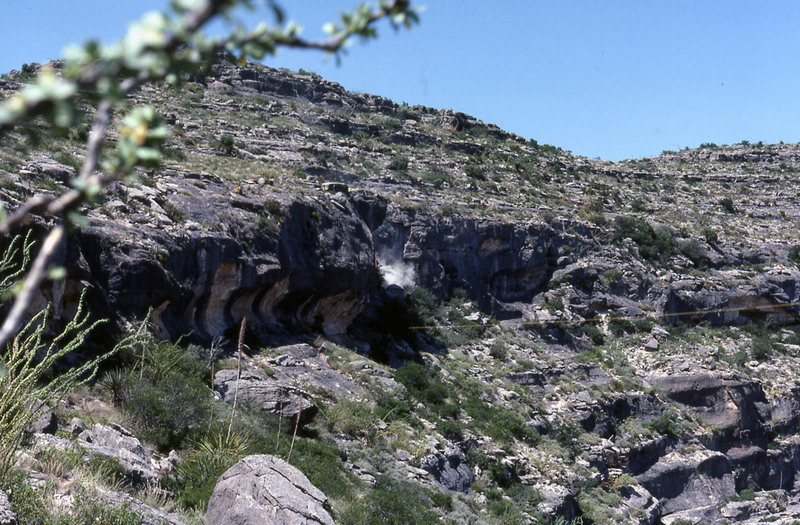 Eagle Cave (41VV167) lies within Eagle Nest Canyon, a short box-canyon tributary of the Rio Grande, just downstream from Langtry, Texas. The canyon is owned and protected by the Jack Skiles family. 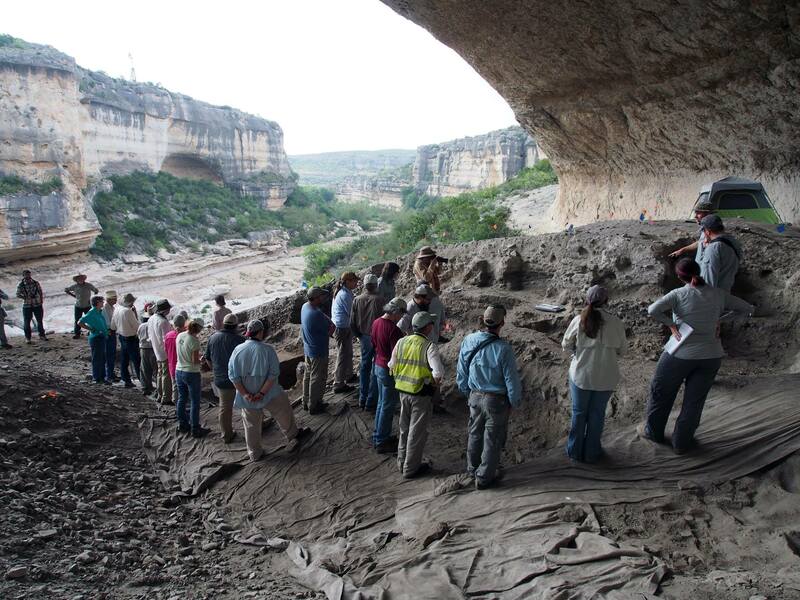 Eagle Cave is one of the largest rockshelters in the Lower Pecos Canyonlands, and has been scene of archaeological investigation beginning with Sayles and Kelley in 1932, the Witte Museum in 1935-1936, UT Austin in 1963, and now Texas State University. 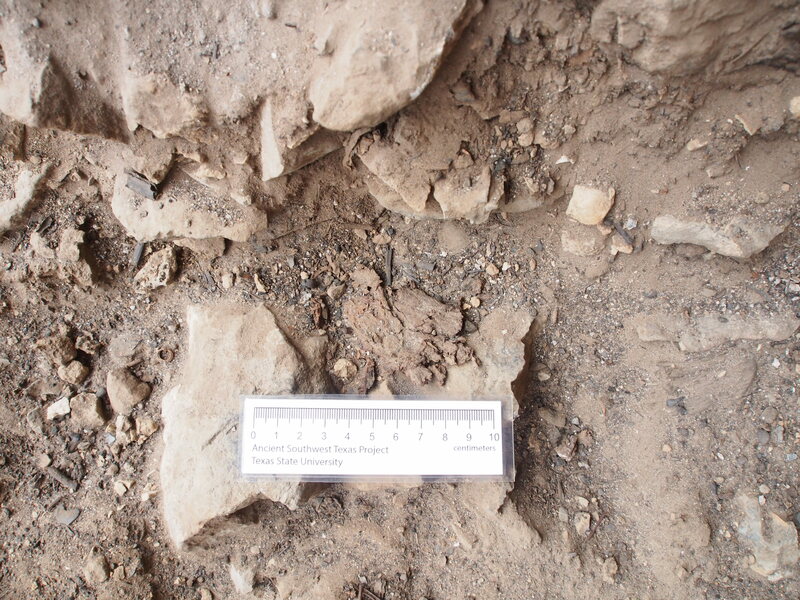 The legacy of the previous archaeology was a long, deep, minimally backfilled trench through the center of the shelter that continues to erode and destroy the extant intact deposits. Eagle Cave as viewed in 2014 (left) versus 1936 (right). 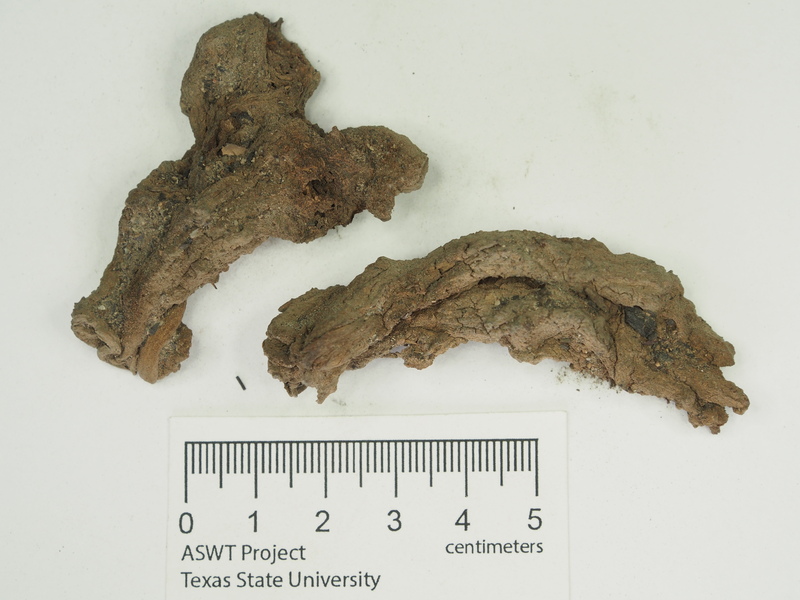 Image on the right courtesy the Witte Museum. The large central trench, as well as a smaller unit on the upstream end of the shelter, was left mostly open. 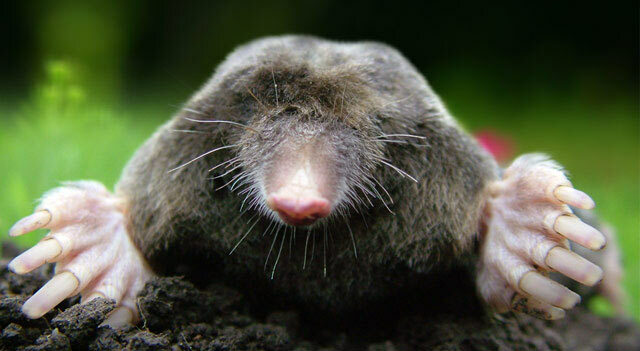 Since the 1960s, the trench walls have slumped, collapsed, and gradually eroded by foot traffic, animal burrowing and wind, leaving a massive linear depression. 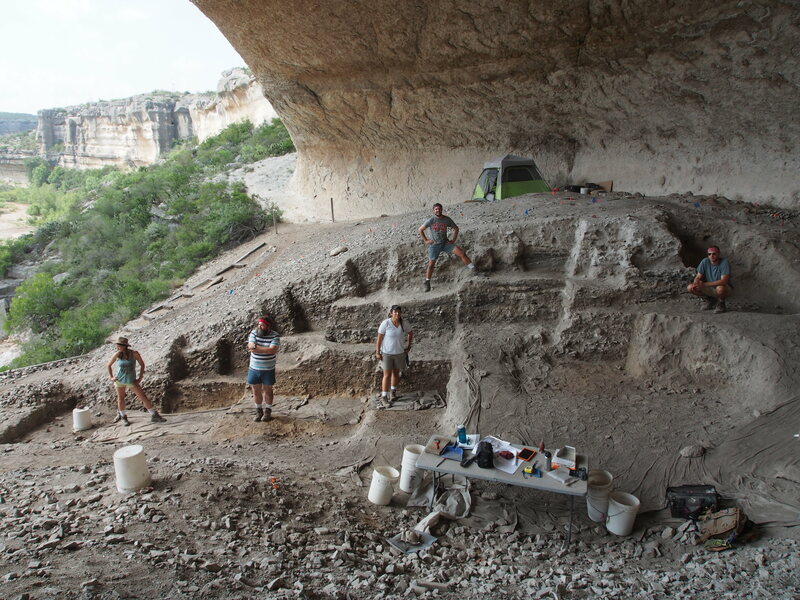 In 2014 the Ancient Southwest Texas (ASWT) project returned to Eagle Cave with the ultimate conservation goal of backfilling all holes and stabilizing the site surface. The 1930s trench begun by Sayles and Kelley and expanded upon by the Witte Museum (left) was about 6 feet wide. When the Amistad Salvage Project cleaned out the trench in 1963 (center) it was somewhat wider. Fifty years later the once vertical excavation walls have collapsed into massive depressions (right, circa 2003). Yellow arrows point to a unique spall. 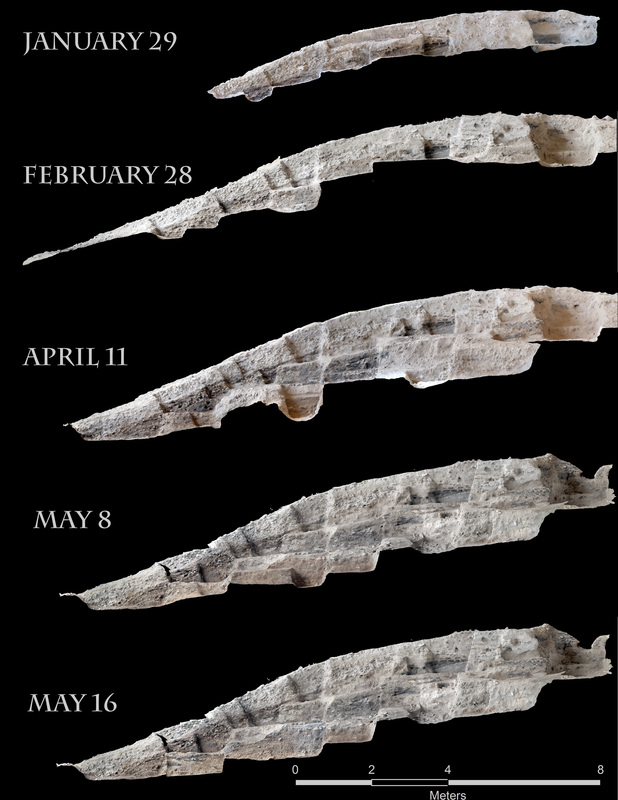 Based on lessons learned in 2014, in 2015 we had the ambitious goal of exposing, documenting and sampling the entire south wall of the main trench. 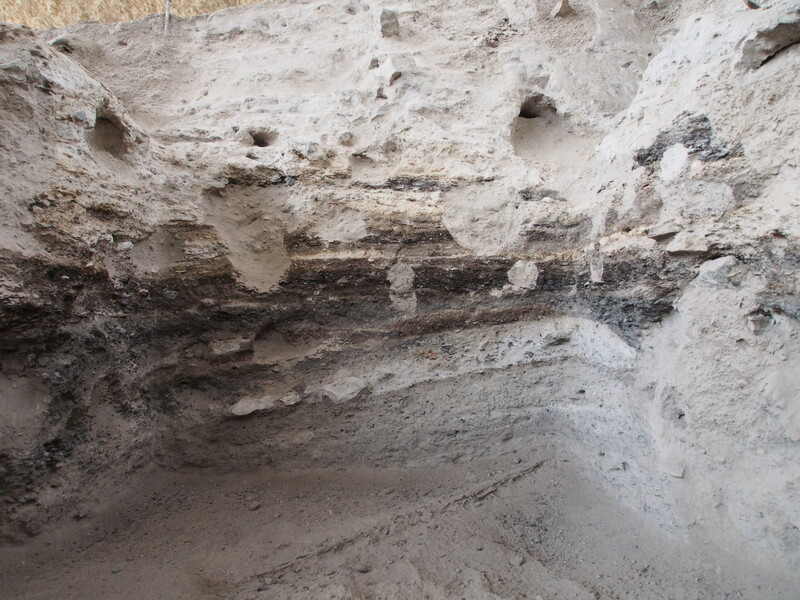 We cut back the slumped wall and exposed the largely intact stratigraphy to frame the microstratigraphic layering within the context of the larger structural patterning visible across the site. In order to maintain stability and provide access, we stepped our profiles vertically and maintain the “Low Impact, High Resolution” sampling strategy we adopted at the outset of our work. 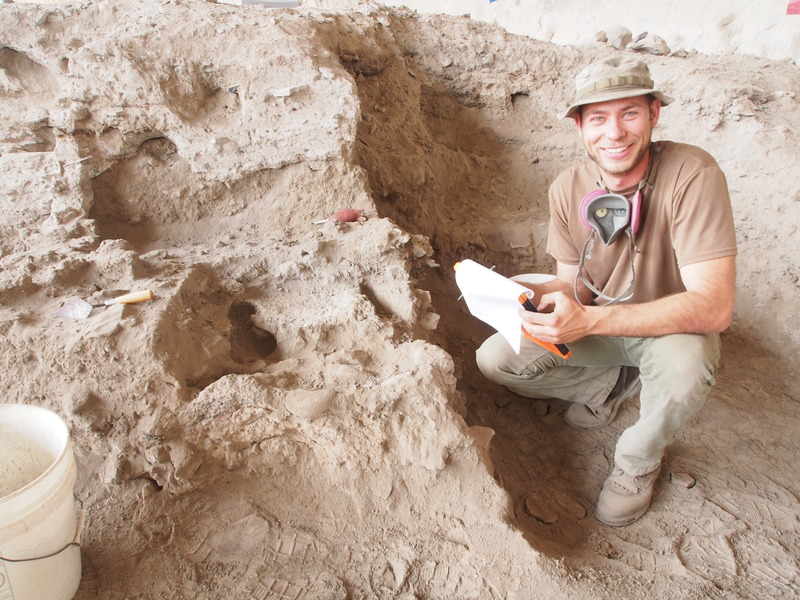 Our excavations focused on the south side of the main trench. Beginning at the top of the slumped trench wall, we removed disturbed fill and excavated small units to expose the intact stratigraphy. 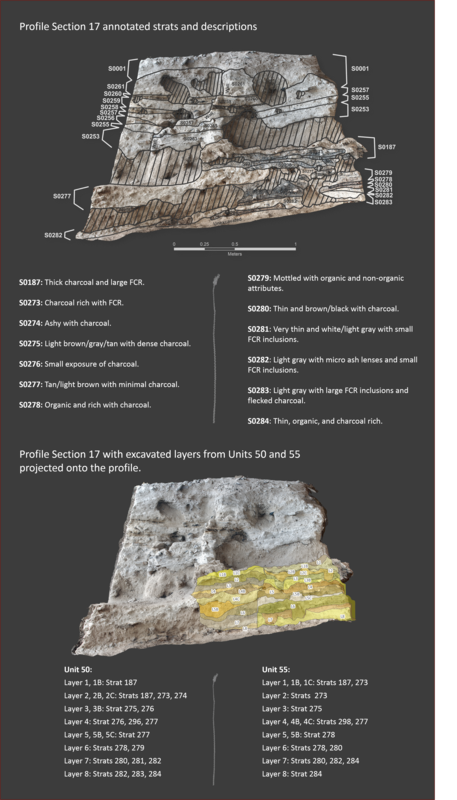 The cleaned profiles were given “Profile Section” designations, and the individual stratigraphic layers/interfaces, or “Strats,” were recorded for each section. Once strats were defined for each profile section, we began high-resolution sampling. We would lay out a sampling unit (e.g., 25-x-50 cm) along the profile section and excavate strat by strat, guided by the exposed stratigraphy. For every sampled strat we collected all the excavated matrix; back in the field lab we sieved this matrix through a ½” geologic sieve. 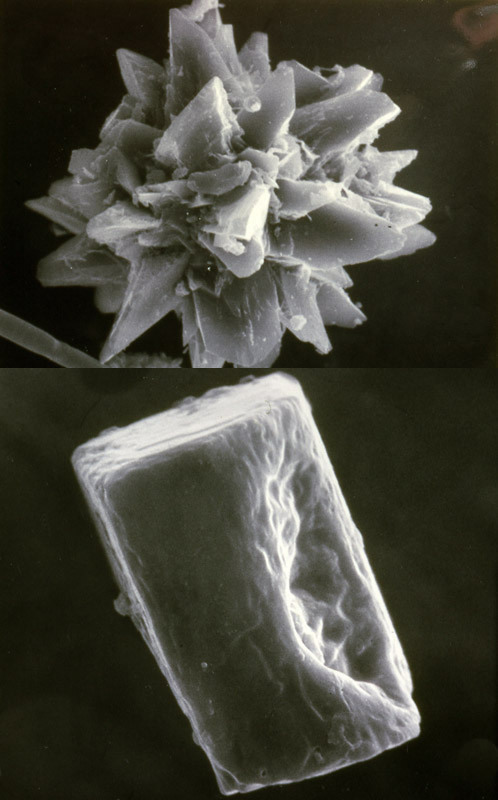 The <1/2” material was split into several different samples, which will be used for future analyses (e.g., macrobotanical). In addition to the tightly provenienced matrix, in situ artifacts were shot in with the Total Data Station and collected individually. 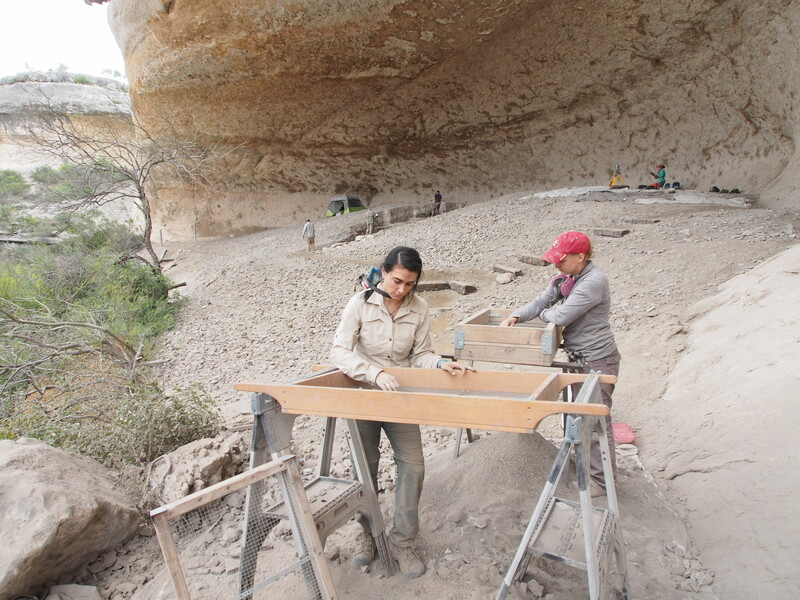 As the excavations continued we stepped the excavation units and profiles as we went deeper. 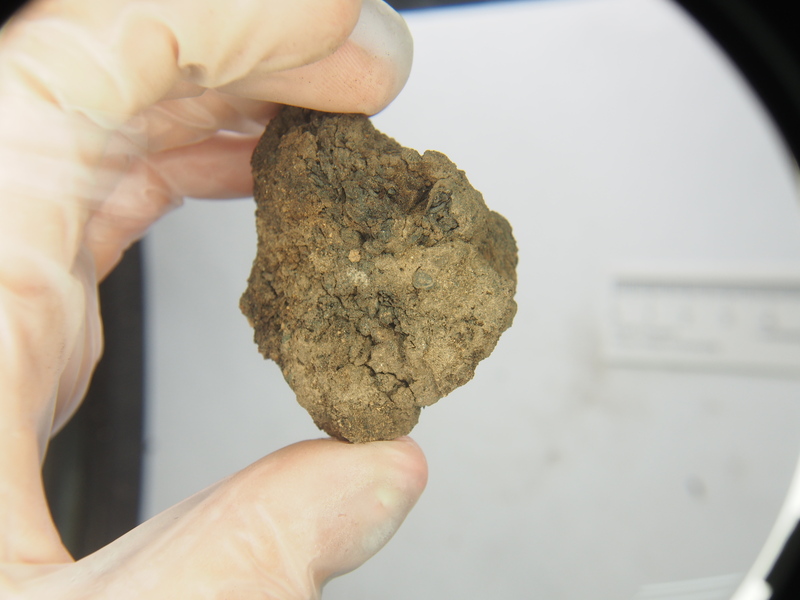 By stepping the trench we are not only stabilizing the delicate deposits, but also preserving the intact deposits for future research. Plan map of Eagle Cave showing the ASWT units from 2014-2015 compared to the UT units from 1963. Illustrated version of the south wall of the main trench in Eagle Cave. 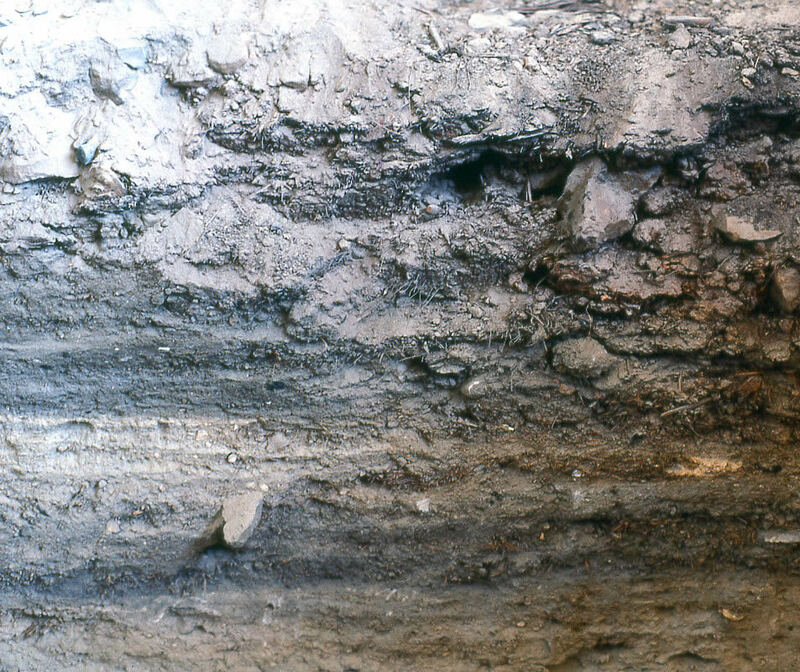 The stratigraphy is depicted as an interim interpretive graphic that does not exactly match the layers identified and described in the field. We have recorded over 300 individual stratigraphic layers within Eagle Cave since 2014. 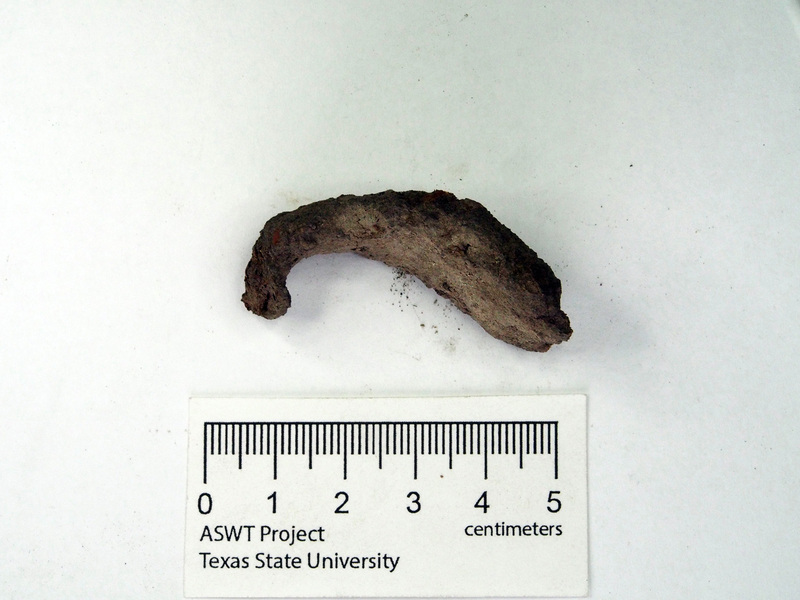 Many of these strats are very thin (<3cm) “microstrats,” and do not extend across large areas of the site. However, as we continue to expose more of the trench profile we are able to assign many of these microstratigraphic to macrostratigraphic “zones” across the site. We have just begun the stratigraphic analysis, but at this point we have five major macrostrats: 1) upper ashy/FCR zone; 2) dense fiber/FCR zone towards the dripline; 3) heavily mixed charcoal/fiber/ash zone; 4) zone of red/brown attrition deposit; and 5) lowest zone of yellow attrition deposits & spalls. 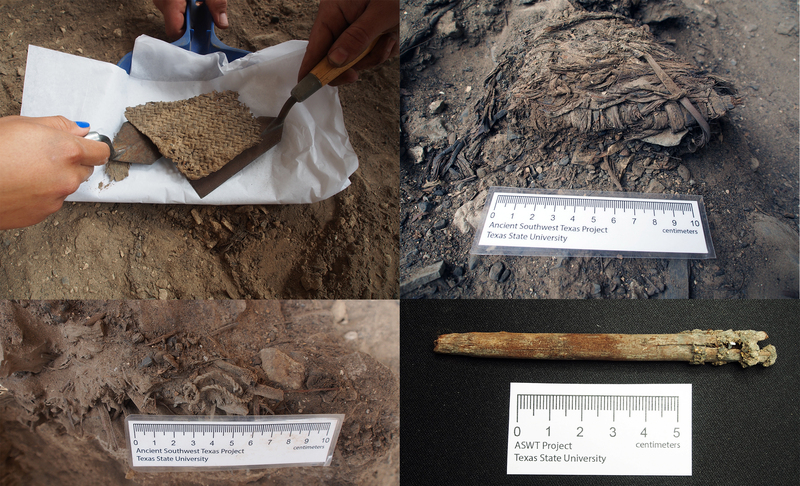 Each of these macrostrats represents differences in activities or discard patterns relating to intervals of site use. One activity that links the upper three zones is earth oven cooking. 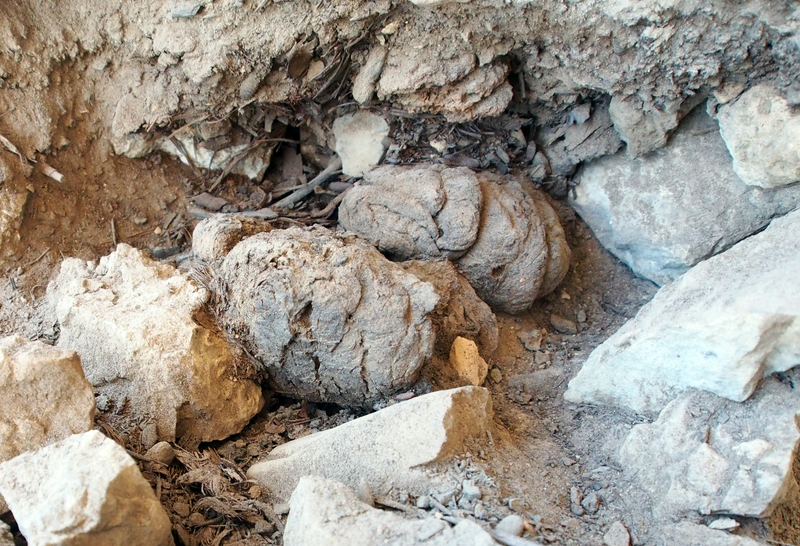 Much of the content is debris from earth ovens (cut leaf bases of lechuguilla and sotol and FCR). We can follow what we infer are successive iterations of oven pit construction and use. It is only by creating large exposures that we are able to identify macrostrats and begin to understand how the hundreds of microstrats fit into the larger structural and behavioral patterns. 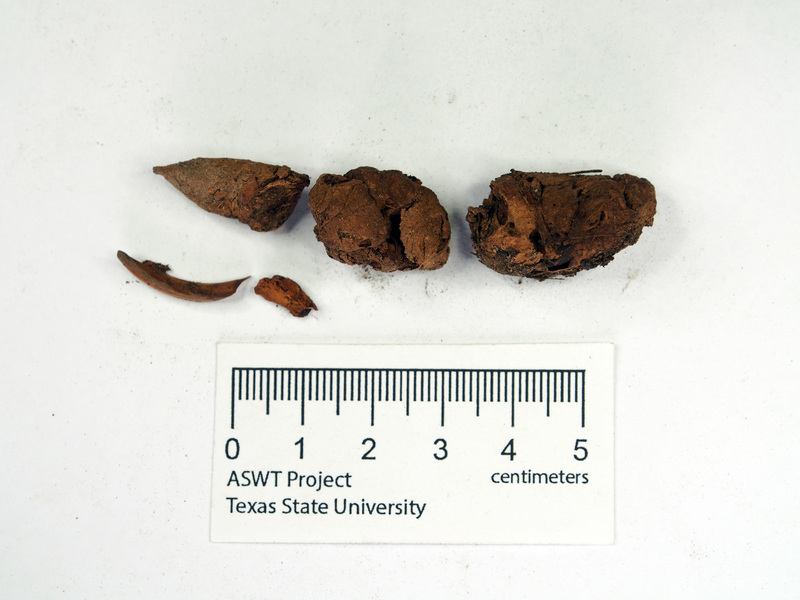 A variety of items recovered in situ from Eagle Cave (clockwise from top left): woven mat fragment, sandal, coprolite, dart point, painted pebble, lechuguilla central stem, two views of an antelope skull fragment, cordage, and a dart foreshaft. 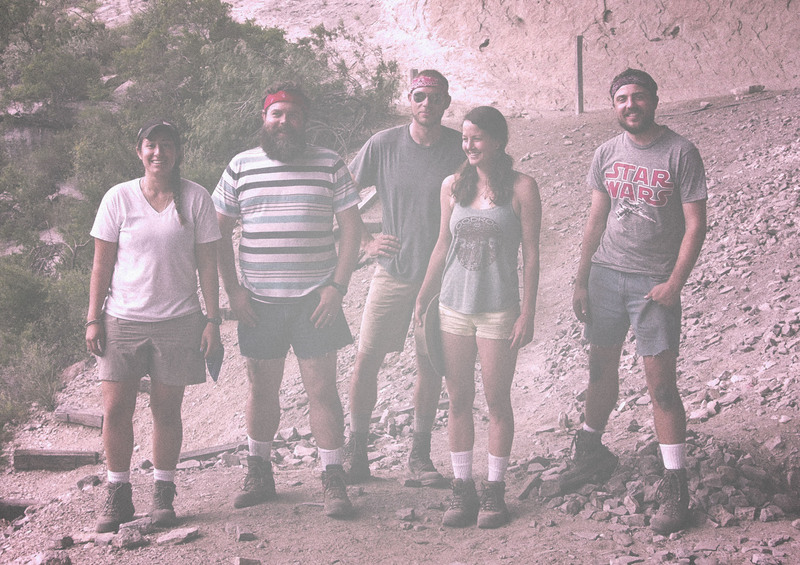 As the 2015 field season drew to a close, we knew we did not have the time to finish exposing, documenting, and sampling the entire south wall. In 2016 we will continue what we started in 2015, and finish exposing and sampling the profile. 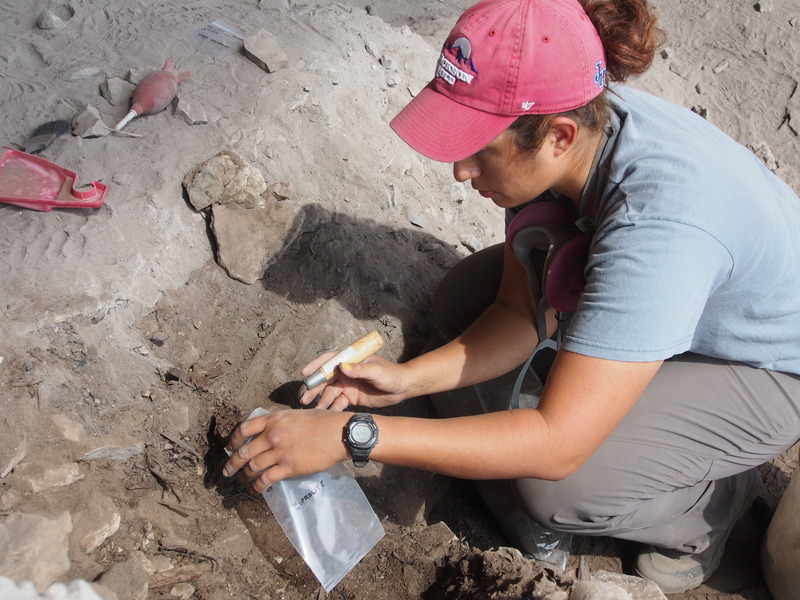 As we dig deeper, we are excavating deposits that have never been fully evaluated, and the data we will collect will be invaluable for understanding at least 9,000 years of hunter-gather use of Eagle Cave. 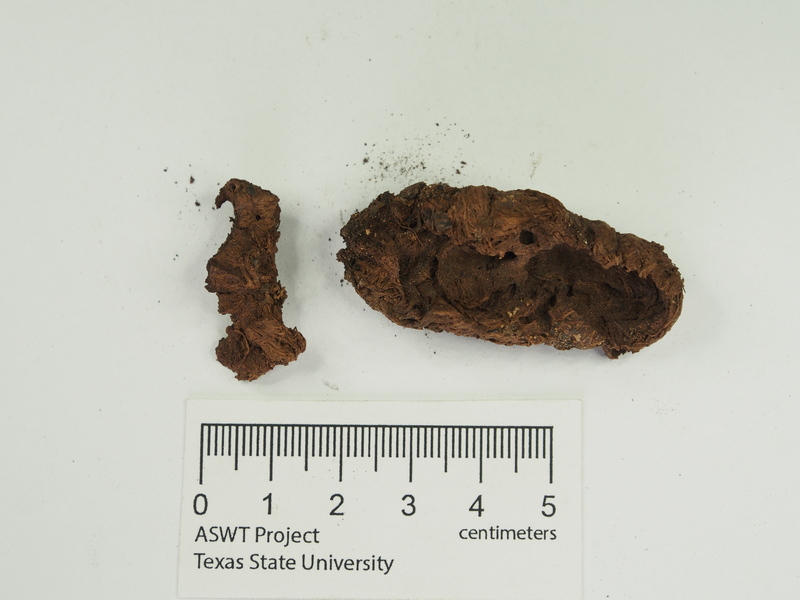 We anticipate that our hundreds of samples will be analyzed for decades to come, much like those from the 1970s Texas A&M excavations at Hinds Cave. 3 Internship positions available for 2016! See the 2016 Call for Interns here:2016 Eagle Nest InternshipCall. Hello again, it’s Victoria here to tell you that I’m excited. 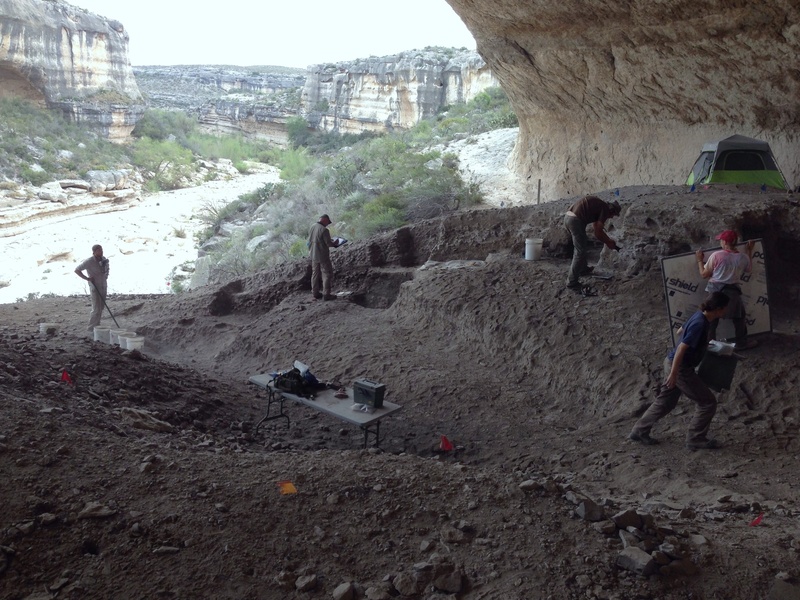 Excited about the work we’re doing out here in Eagle Cave and with the ASWT project as a whole. Now this is not to say that I wasn’t enthusiastic when I first found I would get a chance to intern in an amazing place, with knowledgeable people, learning and doing great new things; but, I’m writing now with a little training under my belt as to the way things work and and a better understanding of how absolutely fantastic it really is. 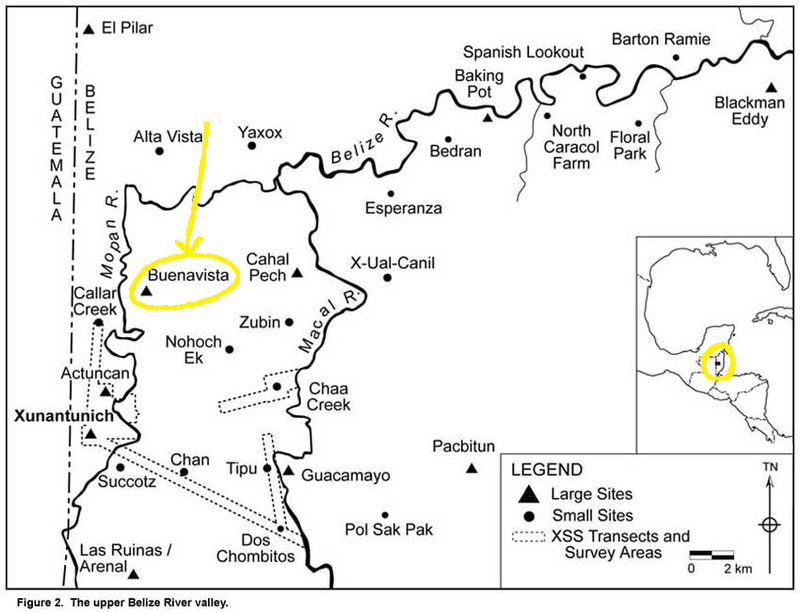 Okay, this isn’t at Buenavista, but it is one of the sites that is worked on by the project. 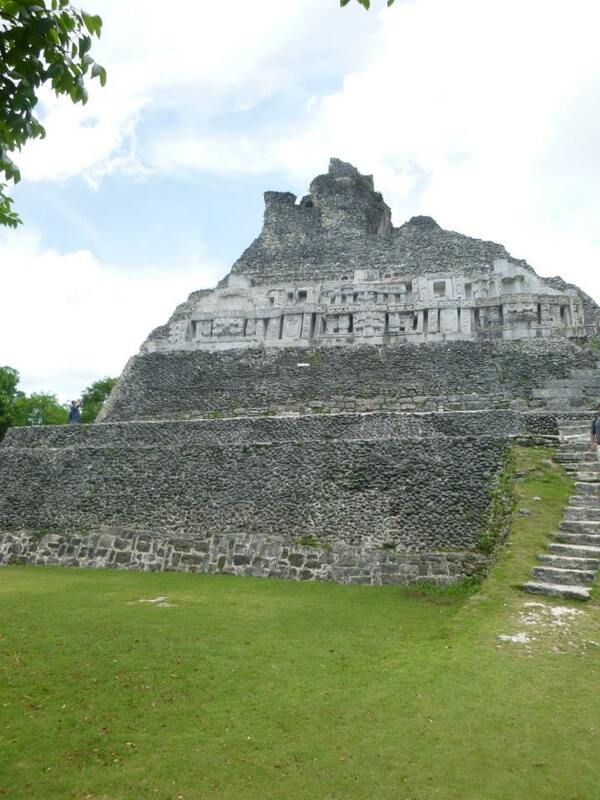 Mighty “El Castillo” at Xunantunich, just one example of the architecture and archaeology to be found in Belize. 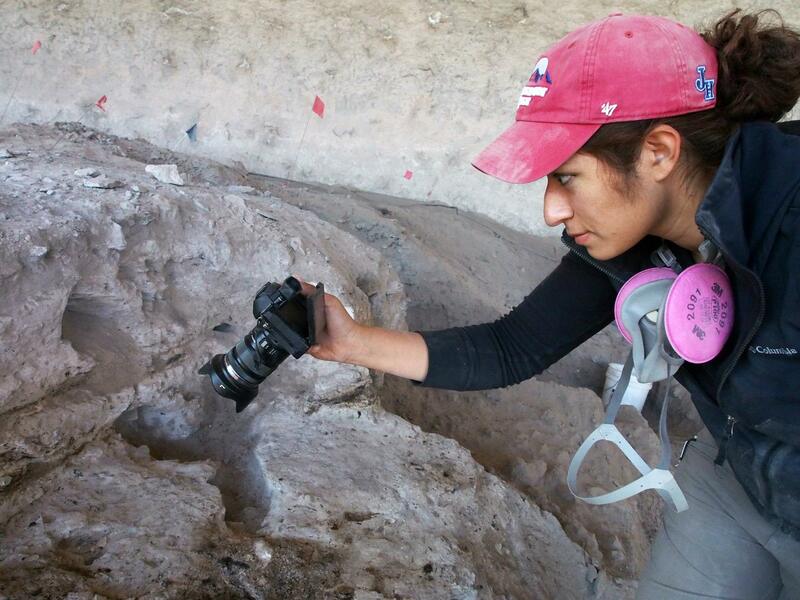 First, I would like to tell you a bit about my first and only field work in archaeology…just to offer a bit of perspective. I was unbelievably lucky to work in Belize. A beautiful country full of cultural and ecological diversity– not to mention the incredible historical and archaeological richness it holds as well. The project was based in the Mopan River Valley, studying the ancient Maya sites of San Lorenzo, Xunantunich, and Buenavista del Cayo. My work was focused at Buenavista, a mid-level city center with plazas and stone structures that had been reclaimed by the jungle. That’s where I worked, Buenavista del Cayo. Just down the river from Xunantunich and many other archaeological sites. 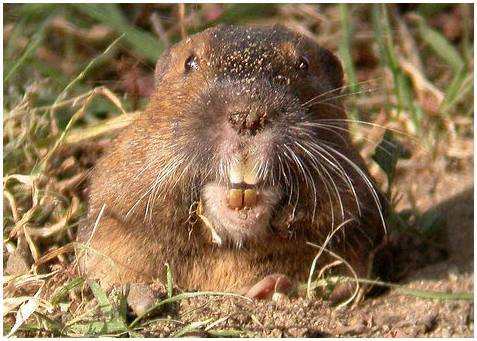 Step 1: Find somewhere you want to excavate and establish an excavation unit. This includes (for most) establishing a permanent datum, laying out the unit, and taking starting measurements. Step 2: Establish your excavation protocol. Are you going to follow natural breaks in the stratigraphy, or are you going to use an arbitrary measurement to create your strata, lots, layers, etc. You’ll probably want to sketch and photograph the starting and ending surfaces, too, as you work your way down. 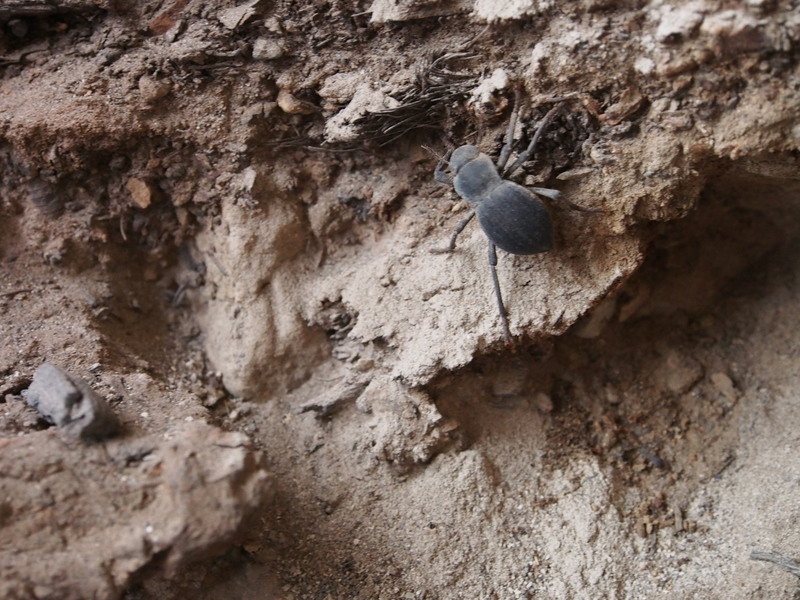 Step 3: You find something really cool in the floor or wall of your unit… a hearth, post-hole, projectile point, a body, etc. — you decide you want to make sure this is in your notes (hopefully you are taking notes, good notes), so you need to take additional steps. Step 4-6: You need to 4) Take photographs— with a scale and some indication of direction 5) Map it i.e. create a drawing by measuring to and from objects in your unit to an established point or points, like a sub-datum. This will yield a plan or profile map with detail as to where your find is and where everything else in your unit is in relation to your find. Detail, detail, detail! Depending on how precise you want your map to be, if you have help, and your level of OCD, drawing a map can take anywhere from minutes to hours. 6) Take more notes of the object’s location, this may include a GPS point that you tie to your datum later, or measurements that you will use to associate the object’s location relative to the datum. Step 7: You’re probably pretty tired from all those steps you took to draw your unit. You need a nap, but chin up, you established your unit today AND you found something! Hopefully your notes are good, you read that compass properly, and you’re mapping skills are adequate enough that your map doesn’t simply look like a box with a few misshapen circles, squiggly lines, and a triangle. Now I have nothing against all those steps (the old fashioned paper and pen method works), but there is always room for improvement. So why is it I am so ecstatic to work in a place where there isn’t monumental architecture, elaborate burials, mysterious mythology and codices? Structure from Motion. What is Structure from Motion? Here I am focused on photographing my unit for SfM. 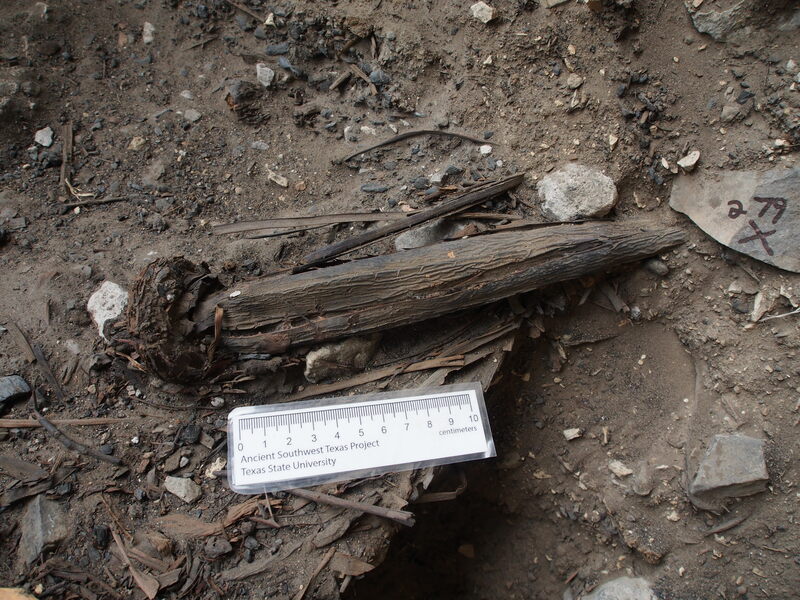 Structure from Motion (SfM) is a surprisingly simple technique that is easy to learn, quick to do in the field, and potentially available to archaeologists wherever they work, or at least those with access to modern technology. SfM uses still-motion photography to rebuild real-world, dimensional objects. Using a digital camera you take a series of overlapping, sequential photographs of your desired target and run them through a software program, such as Agisoft Photoscan. The software is able to match up all the different photographs and build a virtual 3D model of the target (for more info on what Structure from Motion is, see our blog post from last spring: Structure from Motion). 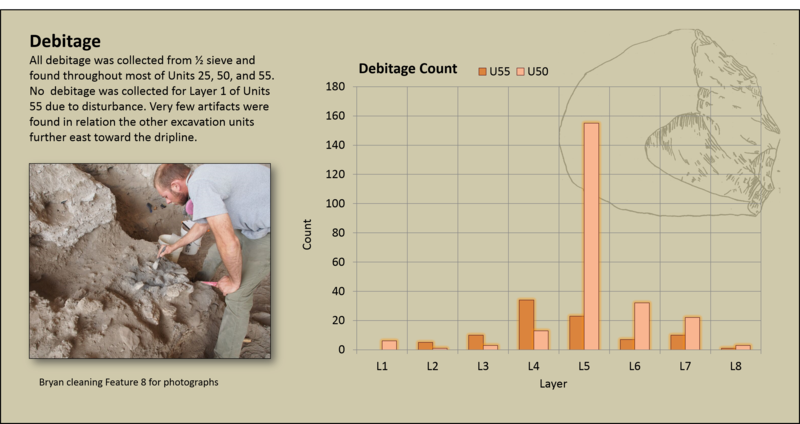 For the ASWT project, we are using SfM to document and record everything from entire sites to small excavation layers. In other words, a digital camera and a computer take the place of the traditional pencil and sketch map technique that I became familiar with in Belize. Creating sketch maps is somewhat fallible in terms of reliability due to human error; we can only record and note what we see or notice at the site. Often, having only a single chance to record something before we move on to the next layer. Even more often when we sketch we focus on the big things, the obvious things, not necessarily because we think the rest inconsequential, but because we cannot physically draw every detail. 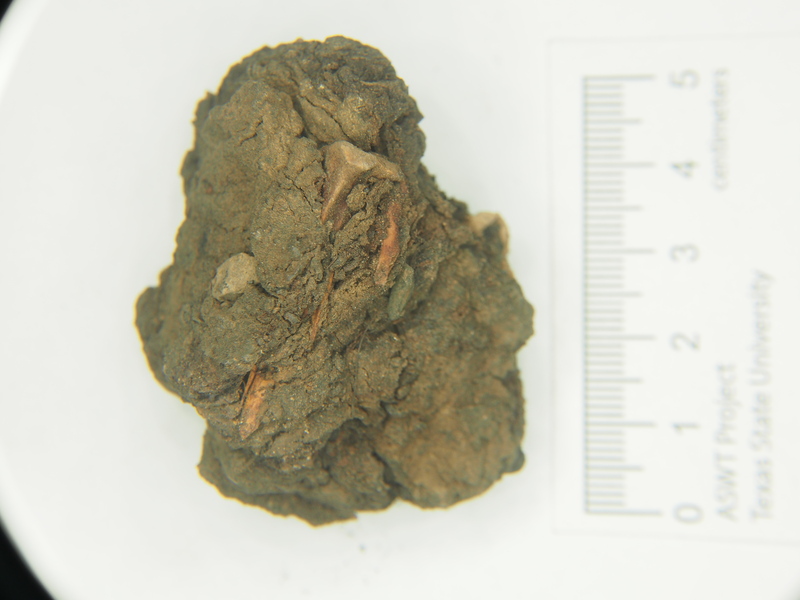 SfM captures all of the visual detail that we can’t see or maybe don’t even think to include at the time because we’re so focused on recording our super cool projectile point or rock alignment. When it comes down to it, many of the steps and methods are the same (we’re still completing forms and taking notes and we aren’t taking any shortcuts), but what really changes is the end product: our results. 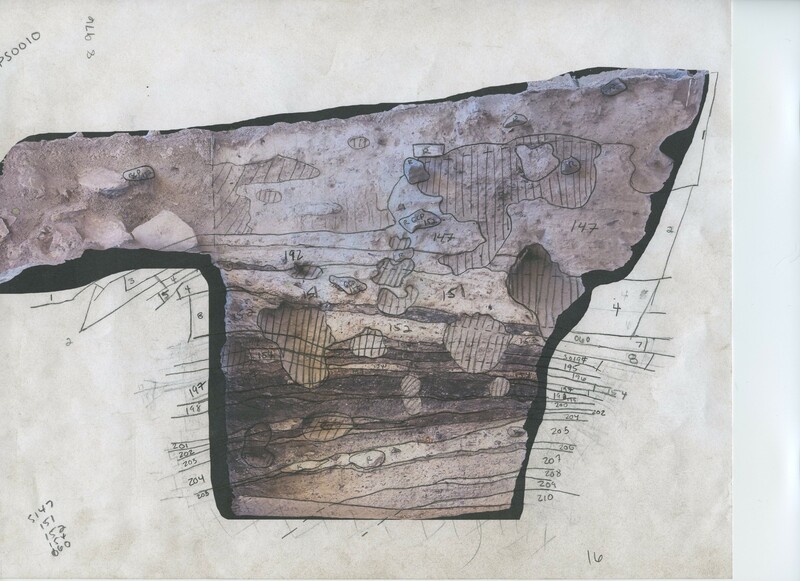 Our notes, drawings, photos, and forms are all we have left after an excavation. 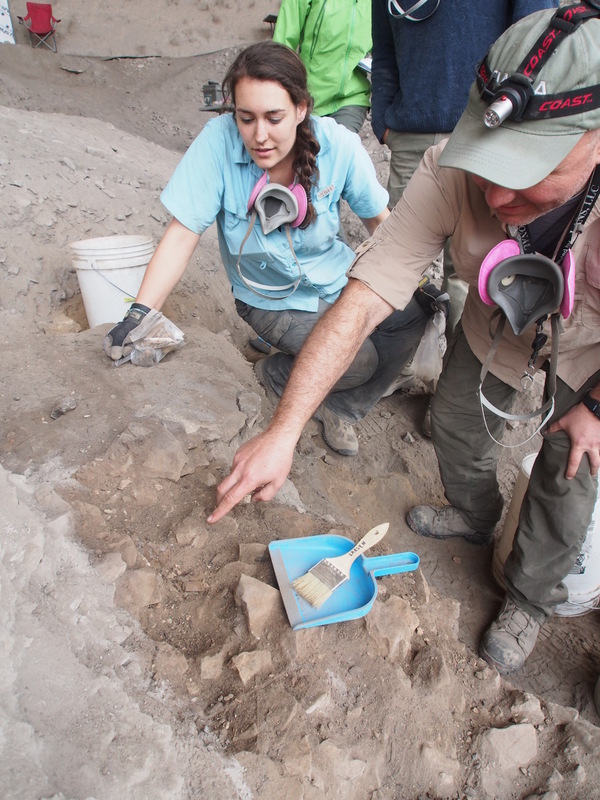 SfM offers us a permanent, virtual record that preserves and offers accessibility to our excavation data for years to come (and dozens more eyes). Nothing gets skipped over, nothing forgotten. Eagle Cave South Trench Strip numbering system. Strip 4 is where I focused my work for the first session in Eagle Cave. 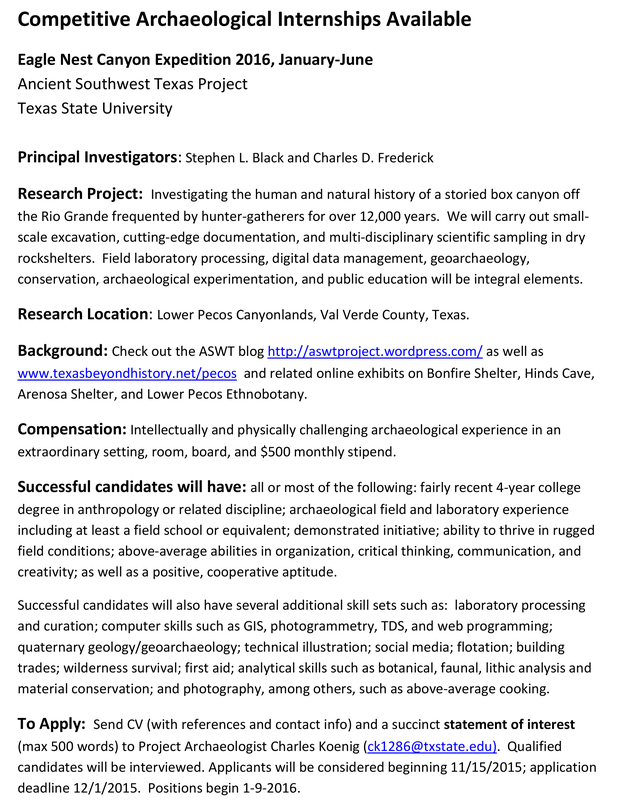 As I mentioned in my introductory blog post, I am interested in archaeological applications of GIS. 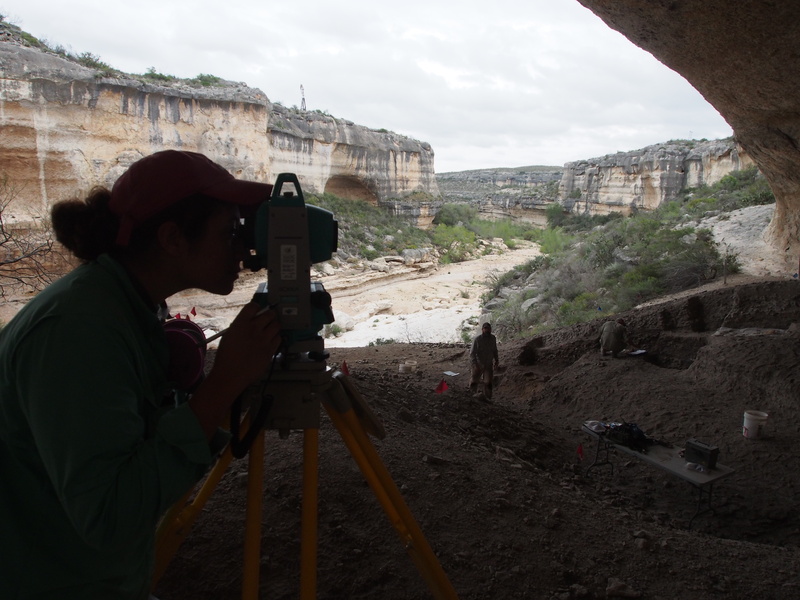 I also mentioned that I was intrigued by the SfM technique that I myself first learned about from this blog [Eagle Nest Canyon at the Texas Archeological Society Annual Meeting]. Now I come to you one month in, with a bit more knowledge on the project and the technique to present another perspective. I spent the January session re-exposing a profile face, PS005, that was initially exposed in 2014. This profile sits in what we now call Strip 4, almost smack dab in the center, top section of the South Trench wall of Eagle Cave. 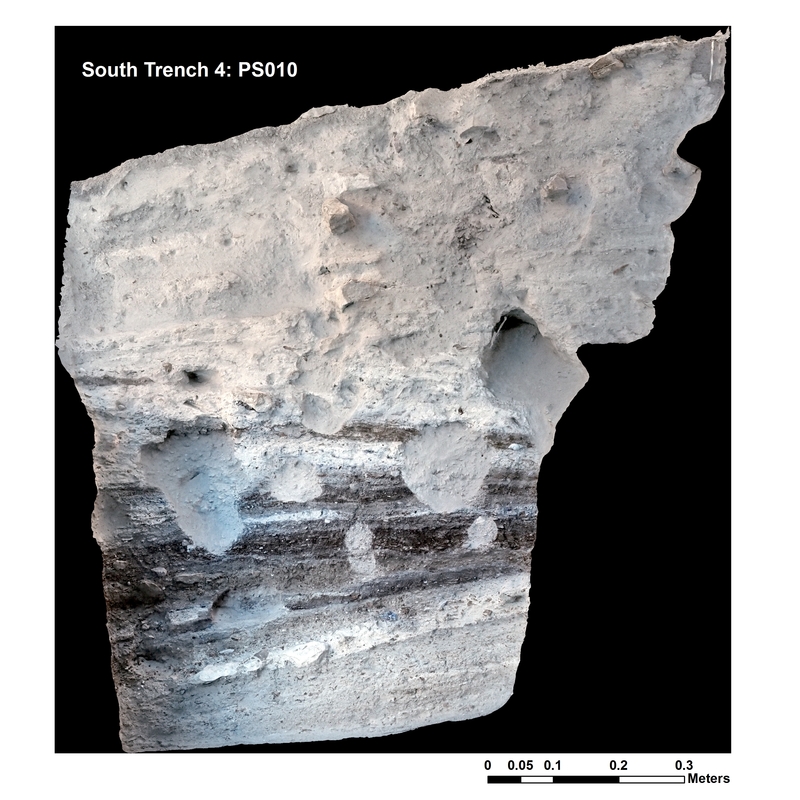 Digital annotation of PS005 orthophoto from 2014 before profile sampling. PS005 with micromorph samples superimposed and georeferenced onto the profile. At first it was a mess. 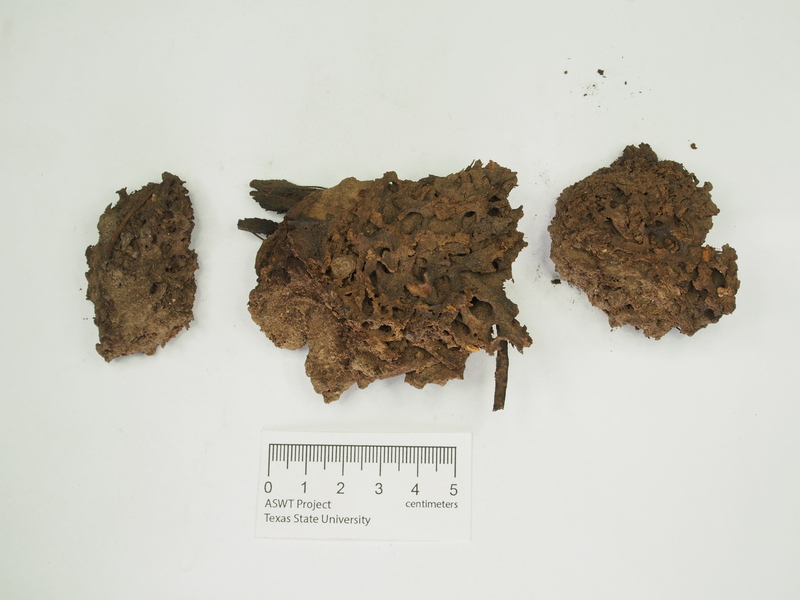 After removing the backfill and geo-cloth, we discovered that the profile face had suffered damage from continued erosion and rodent burrowing since it was originally exposed. In 2014, the investigators assigned strat numbers based on their original profile exposure –i.e. each visible stratum received a unique number. 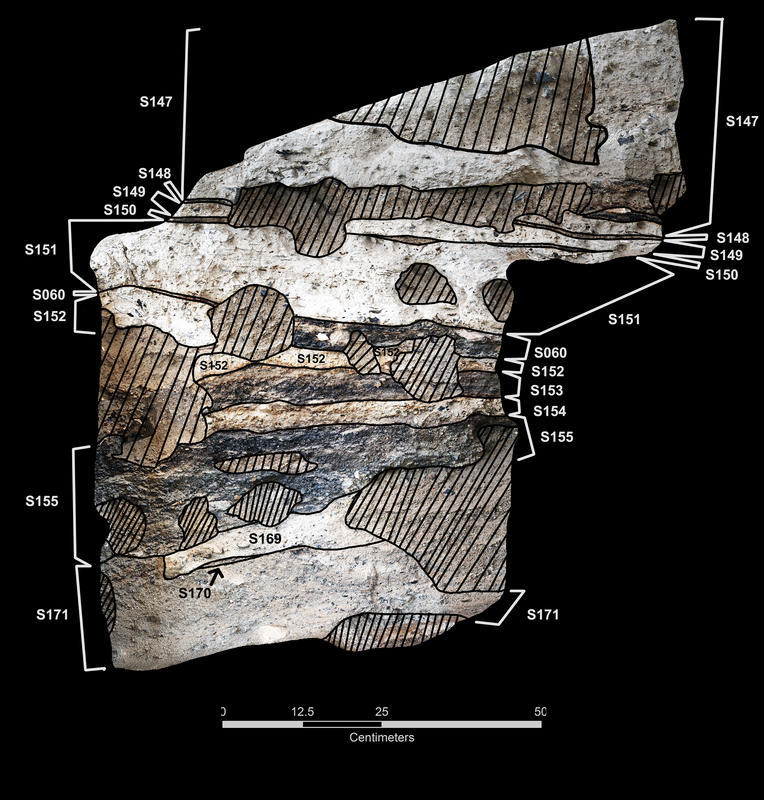 However, they then excavated a small sampling column and did their best to follow the layer seen in profile across the unit. 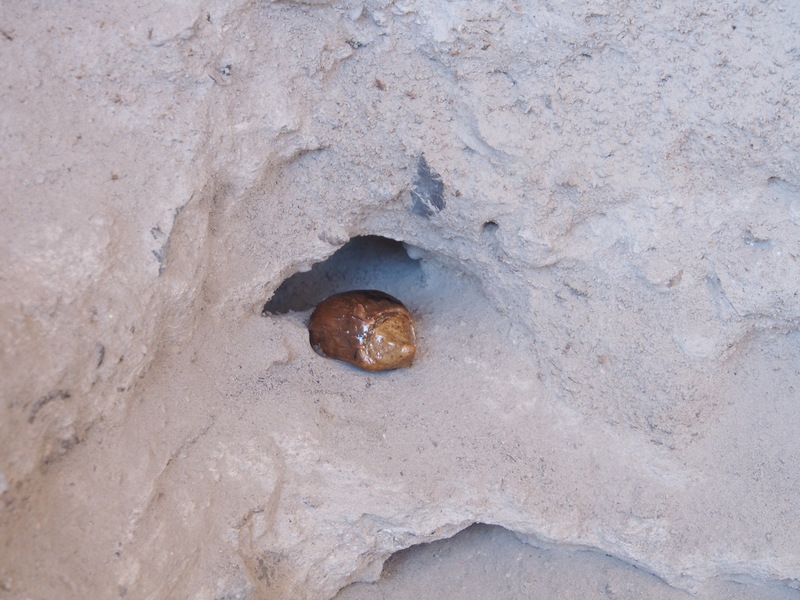 The presence of numerous rodent burrows, especially through the ashy layers, made strat definition challenging. 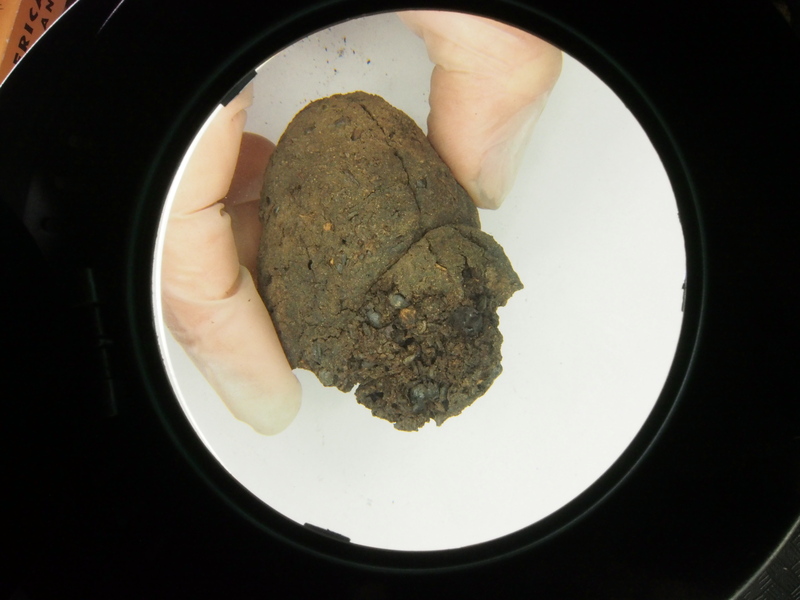 I should add one more factor, at the end of the 2014 excavations the PS005 profile was sampled by the geoarchaeologists who removed micromorphology samples. Although done carefully, the wall was no longer pristine. PS005 profile we exposed in 2015. 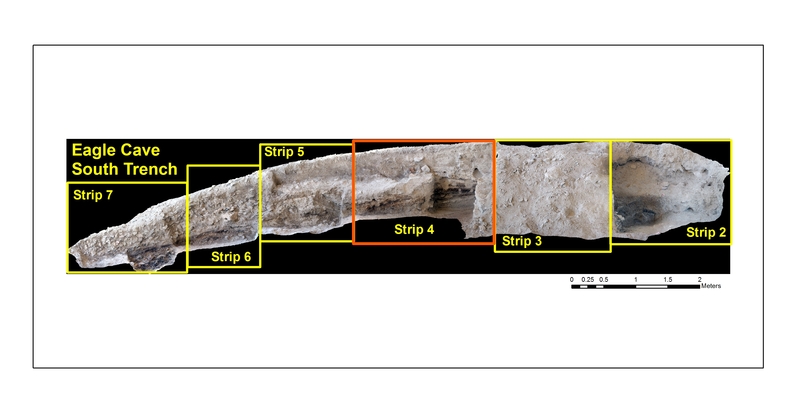 1) Cut back eroded face (profile) and re-expose the stratigraphy. 2) Collect high-resolution samples of the matrix and artifacts within the profile. 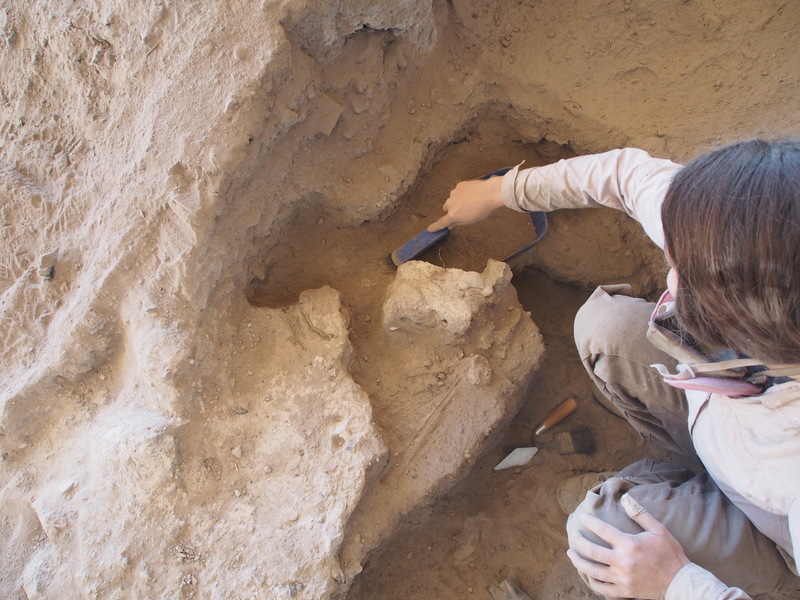 Excavating a sampling column involves collecting the matrix of each layer (along with things like Spot Samples, Geo-matrix Samples, and samples for radiocarbon dating) that can be further analyzed in a lab. We are not only collecting samples of each strat, but using the TDS shots of each sample and the strat location, we will add them all to the SfM model. So whoever processes and analyzes the samples can have a virtually exact geospatial reference of its origin. 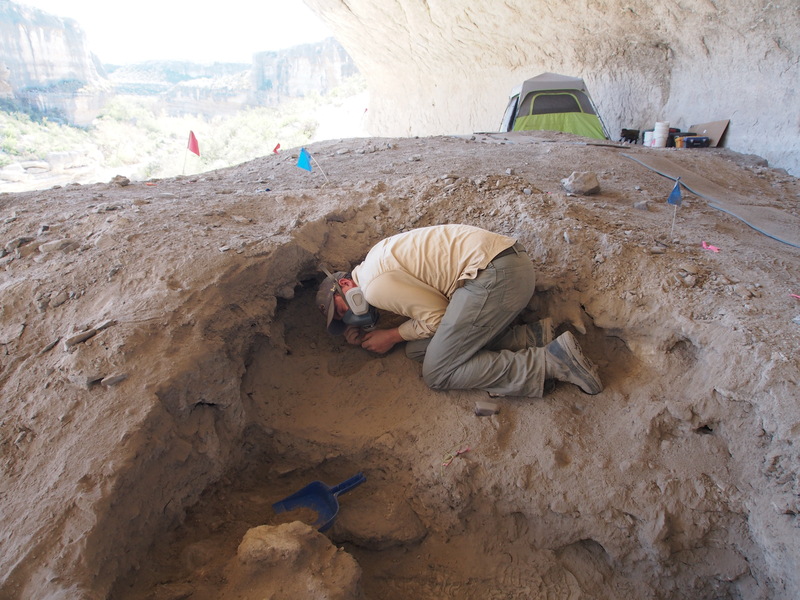 This will help us build an assemblage of associated artifacts, radiocarbon dates, and deposition event, aiding in our understanding of the shelter and the canyon: how it was used, when it was used, what they were doing there. 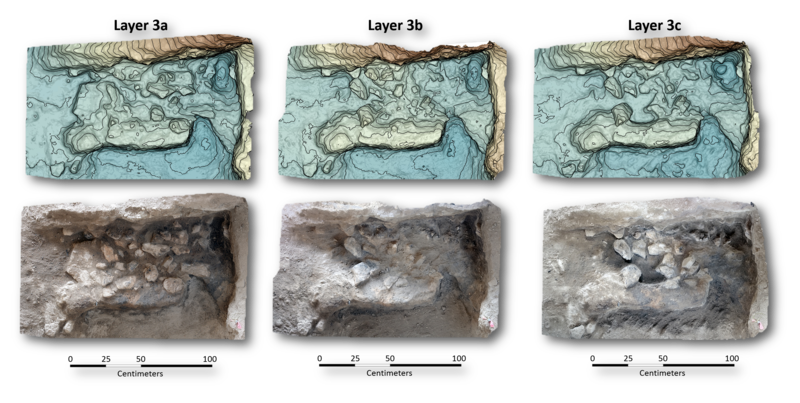 Rather than draw a standard paper and pen illustration of each layer as we excavated, we instead used SfM to document the top surface of each strat. This not only gives us an idea of what we were looking at, but it allows us to use GIS to calculate volume of matrix removed. Field annotation of the strats in PS0010: 2015, previously PS005: 2014, that Charles and I completed. Once I finished with the sampling column, attempting to follow the strats that were assigned the previous year, the profile face that was exposed was extraordinarily rich. In other words, by cutting back the wall we found better preserved and more complex stratigraphy. The newly exposed profile exposure is called PS010. Previously, only about 10-12 strats were identified in this area. We have now defined 22 individual strata from the “same” exposure. 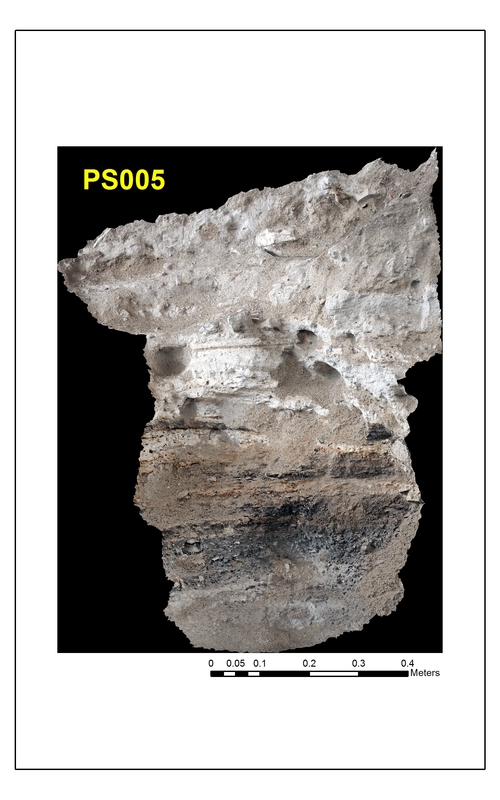 I re-photographed the profile giving us three sets of 3D data: TDS shots, 3D models of all the excavation layers, and now the model of newly exposed PS010. We now have a new high resolution 3D model to overlay all of the excavation layers and samples onto – all of which can be manipulated to aid in analysis. 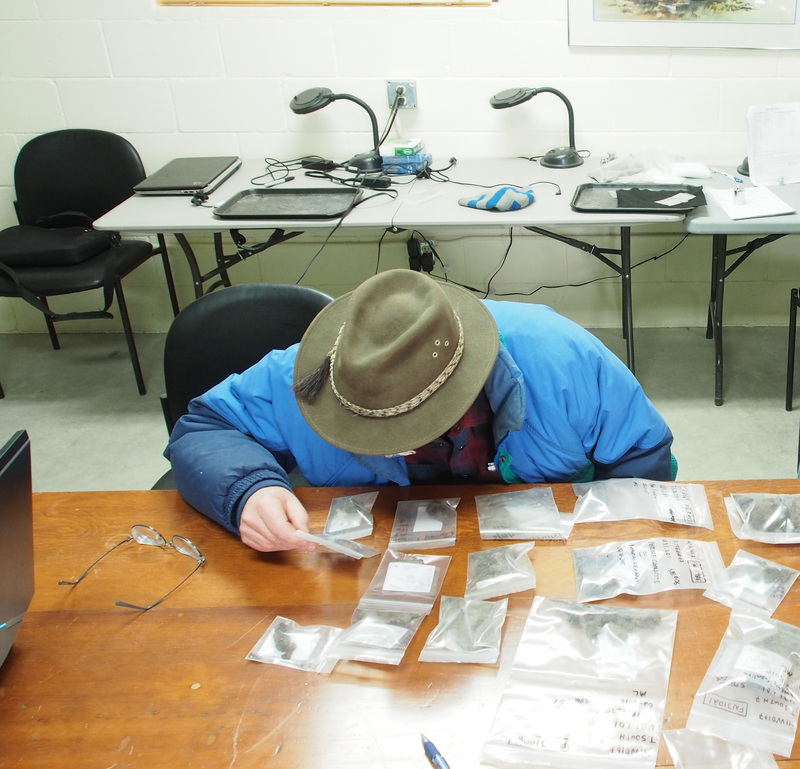 Our field lab is where all the sets of photographs are processed. Using Photoscan we align and georeference all the images for each individual layer. 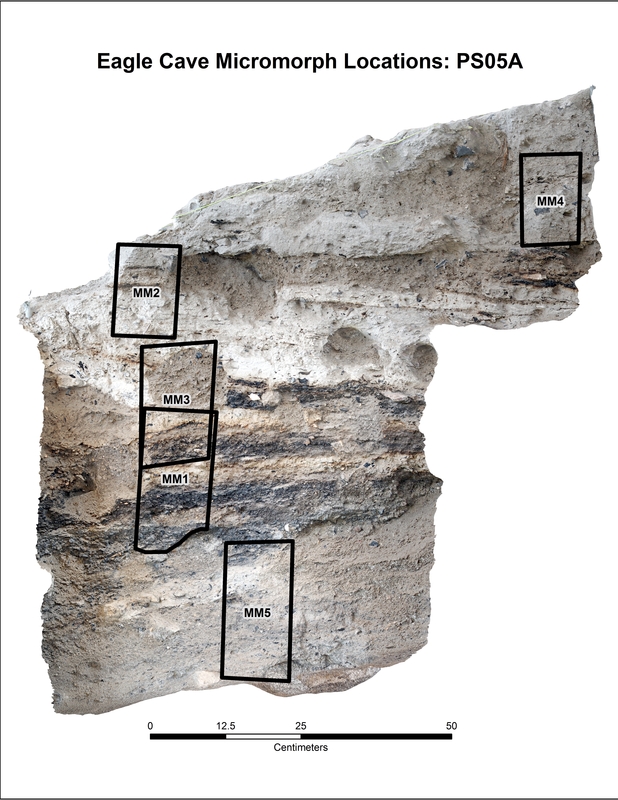 The photographs, GCPs, TDS, and notes are all combined to digitally rebuild the excavation. A 3-dimensional, manipulable dataset that works hand-in-hand with all of the physical data—matrix, artifacts, etc.—and the recorded data i.e. notes, photos, etc. 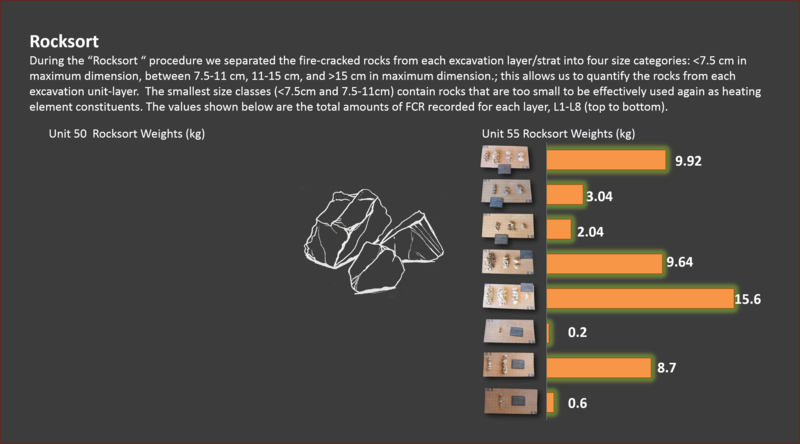 In order to have these georeferenced for GIS or used in photogrammetry, no less than six GCPs, ground control points, are included in each excavation exposure. Ground control points are geospatial reference points that you place on your object or in your unit, shoot in with a TDS or GPS, so that photographs and models can not only be more accurately aligned with each other, but linked to a geographic grid. This becomes incredibly handy when you are working in say, a canyon with multiple sites carrying on extensive excavations that you would like to map and relate to one another. Then, not only can you reference all of your units and sites among the canyon, but you can reference and cross-analyze your work with other sites across the region or the world. Once we have our models we can then export all or parts of the model into many different formats; GeoTIFF, TIFF, JPEG, KMZ, etc. Our models are ready to imported into GIS software where we can further manipulate and analyze them. 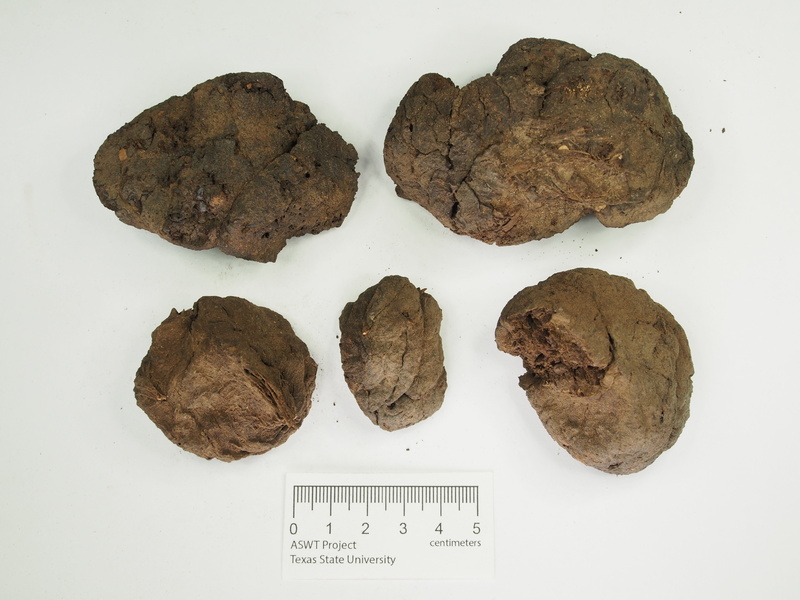 This shows the samples that were taken in the PS005 sampling column. They are superimposed onto the 2015: PS010 orthophoto. Orthophoto of complete PS010 profile face. An orthophoto is created once the SfM modeling is completed, GCPs added into the model, and then exported into ArcGIS for more analysis. 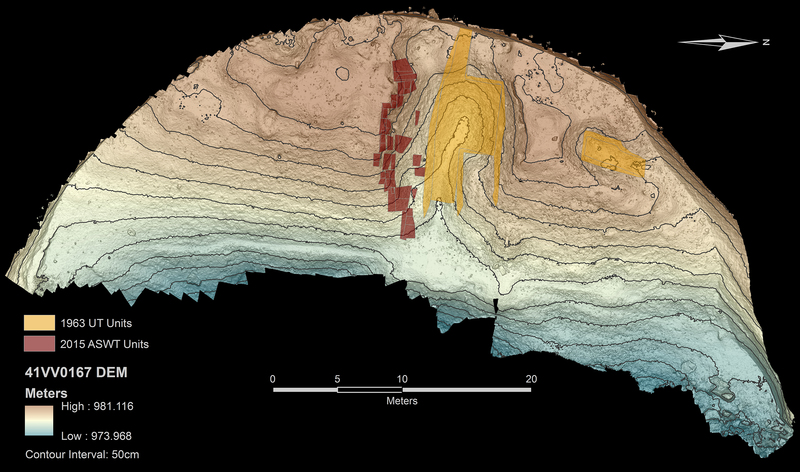 A goal of the ASWT project is to not only excavate and collect, but to gather the best data we can – or best representation of that data –backing it all up with SfM and GIS. Structure from Motion gives us the opportunity to not only georeference our units, finds, and strata, but we can literally rebuild them, at least digitally speaking. 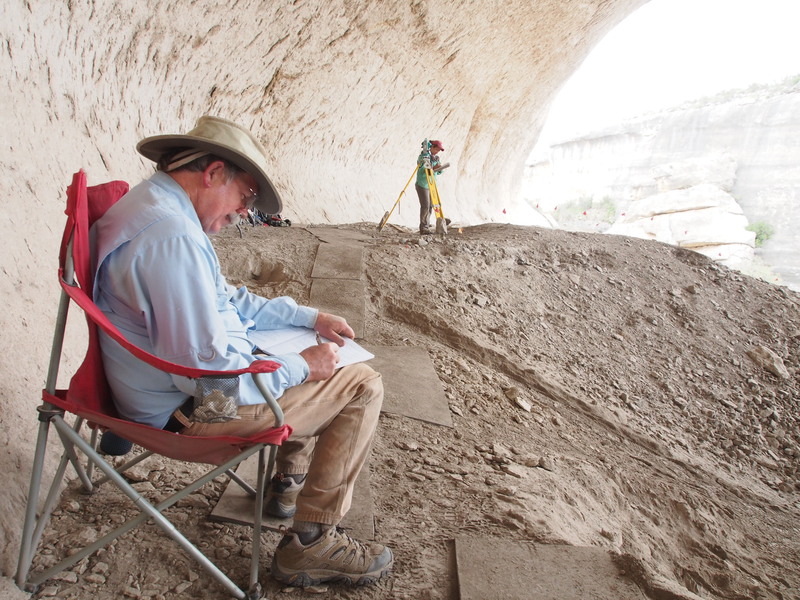 No longer are we relying upon the traditional mapping, measuring, and sketching techniques of years past that result in rather dimensionless visualizations of excavations. 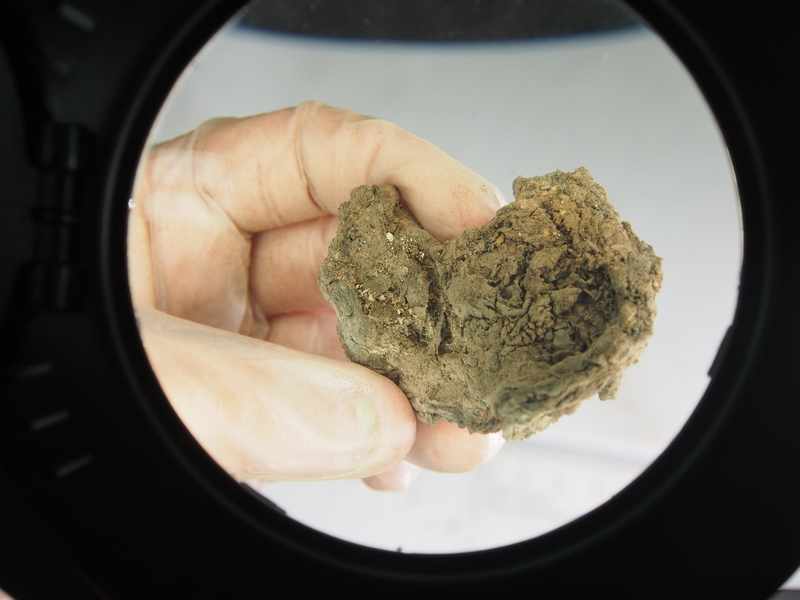 SfM also easily provides a new solution to an old problem: excavation vs. preservation. The basis of archaeology is essentially destroying material history in the name of research and discovery, so that we can preserve and record it as best we can. 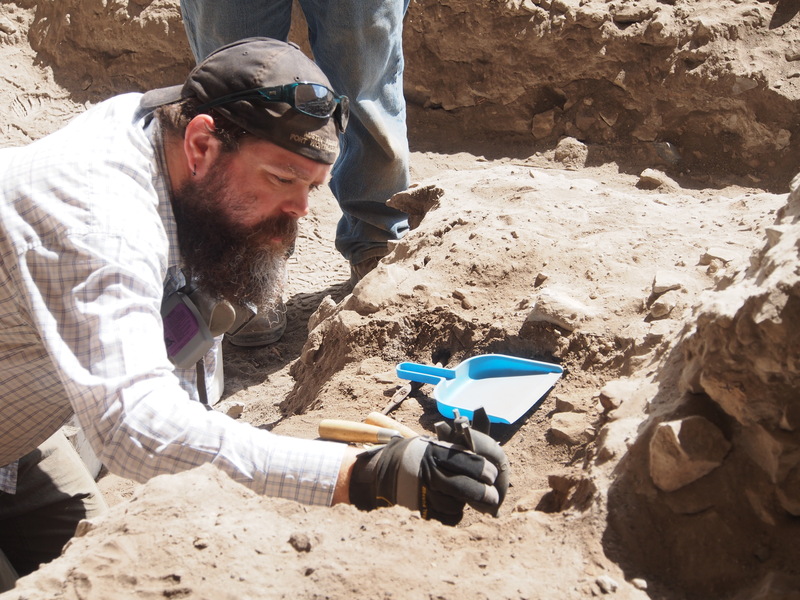 Granted we have gotten much, much better at recording and excavating than back in the early days of the field, there is still room for improvement and innovation. 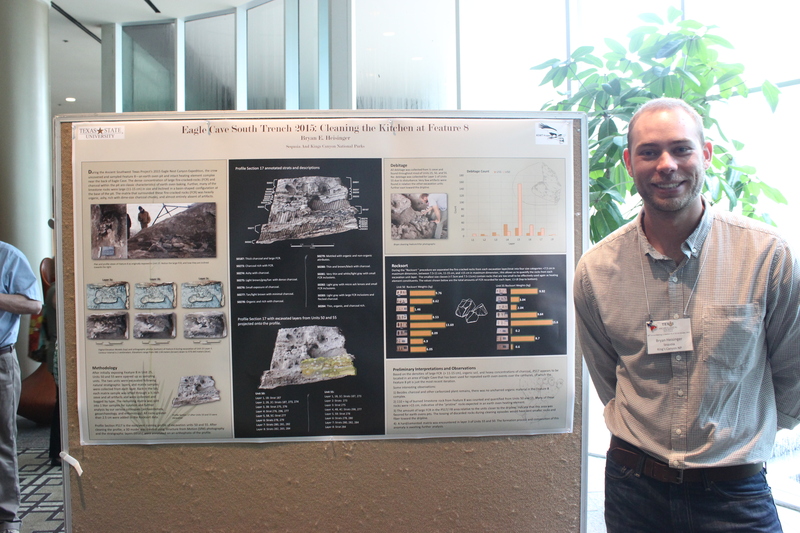 In 2014, Bryan Heisinger (2014 ASWT Intern; 2015 ASWT Staff Archaeologist) presented at the Texas Archeological Society annual meeting, on the uses of SfM and GIS for not only modeling, but extrapolating volumes of material removed and creating digital elevation models (DEMs). These can be used to study stratigraphy and depositional events of floods, people, and even animals– as Emily and Larsen can attest to. 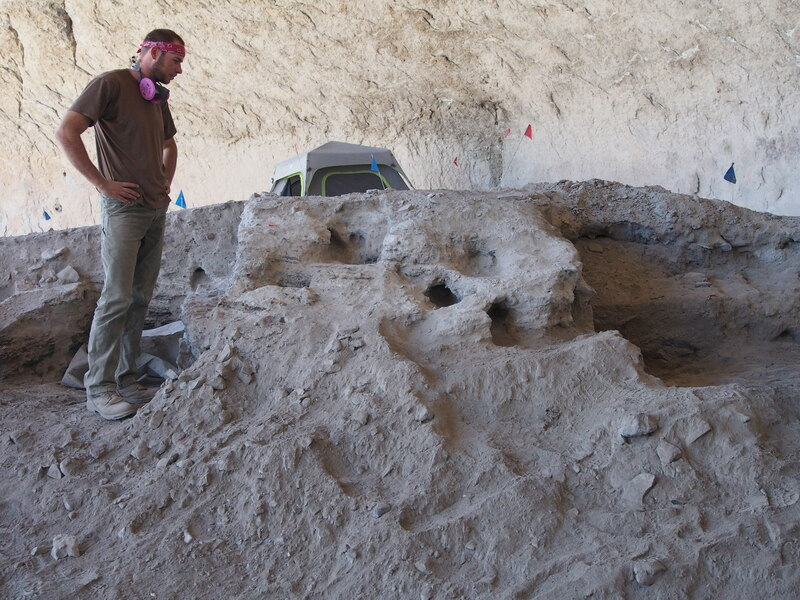 Our documentation of profiles, like PS005 and PS010 helps us build a database of all the excavations and the shelters to aid in the analysis of what is to some a rather abstract concept of time. Our work becomes more dimensional, more visible. You aren’t just looking at the profile of a wall or structure or shelter. You can virtually walk around that wall, walk into that structure, and around that shelter, without ever being there. The outreach potential is exponential. 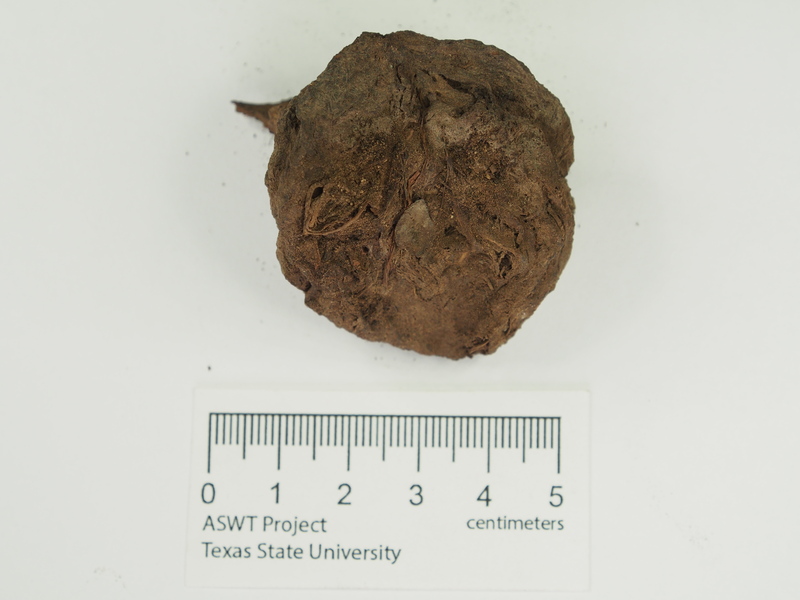 The ASWT project personnel and many of our colleagues believe that SfM is that next step in improving archaeological documentation. 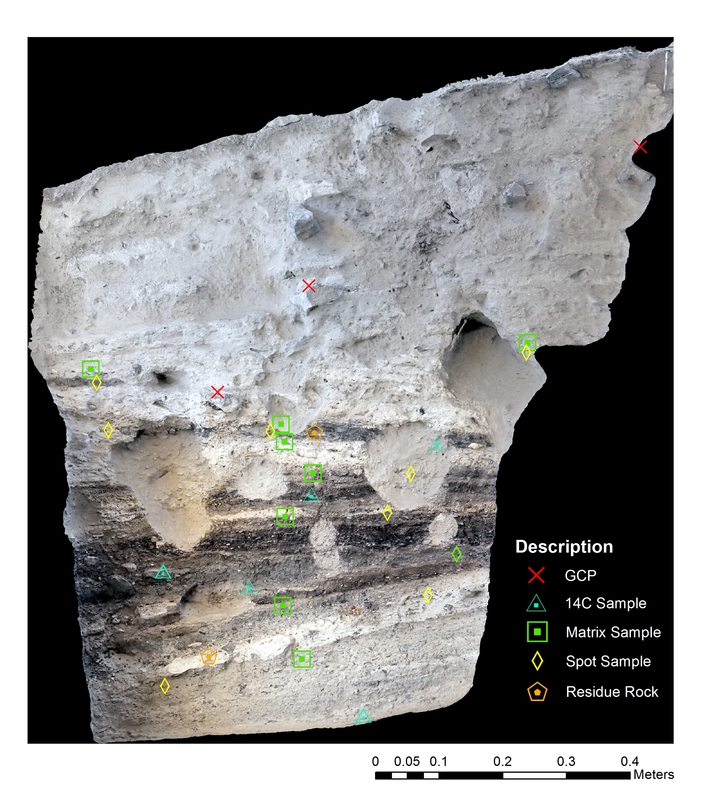 Incorporating SfM and GIS technology we can model excavations with millimeter level precision recording finer detail in stratigraphy and location than ever before. Physical 3-D models that can be pieced together or pulled a part. High resolution, detailed, and accurate data that can be manipulated, viewed, and analyzed virtually any way we desire. Even better we can share our results in a brand new ways: 3D printing, virtual tours, etc., we could and can literally print pieces of art, artifacts, even a scale model of the canyon if we wanted to! 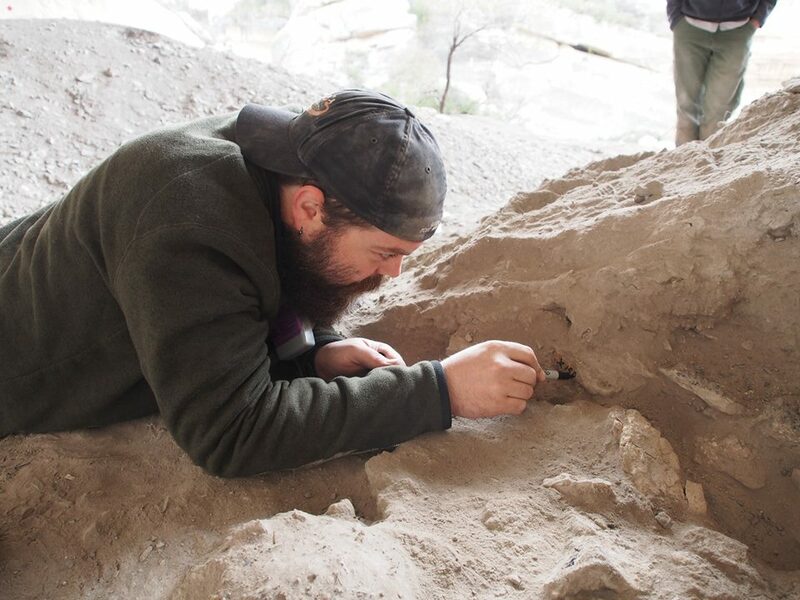 This project, this technique isn’t just for the archaeologists and researchers understand the shelters better, our goal is to be able to help everyone understand the shelters better because the shelters are a part of all our histories. If you haven’t already, you should click on over to our older posts on the subject, and I highly encourage you to visit the Mark Willis Blog http://palentier.blogspot.com/, where you can see some of the other extraordinary uses of SfM 3-D modeling.